The VFX team from dock10 has recreated an entire period village and planted it in the English countryside to add production value to an aerial shot of a steam train speeding across the landscape. "The plan was to do the foreground as CG and the background as a matte painting," explains Alex Dubus, VFX Supervisor at dock10. "This was mostly due to the parallax that was happening in the shot itself. Because we were flying over the village, that had to be done in CG, but we could get away with just matte paintings in the back. One of the first challenges was recreating the terrain so we could put our CG on there so it really integrated seamlessly with the shot. First, we had to recreate the geometry and then we had to re-project a texture, derived from the shot itself, onto that geometry." "Another challenging aspect of this shot, was the variety and number of assets," says Hayley Leonard, Senior CG Artist at dock10. "On top of being set in a particular period, each asset needed to be unique to make the shot look believable. One particular technique that we used was photogrammetry. This allowed us to take our own images of houses and project them onto 3D geometry. For this technique to work, it helps if the photos are taken on an overcast day with as little dramatic lighting as possible. 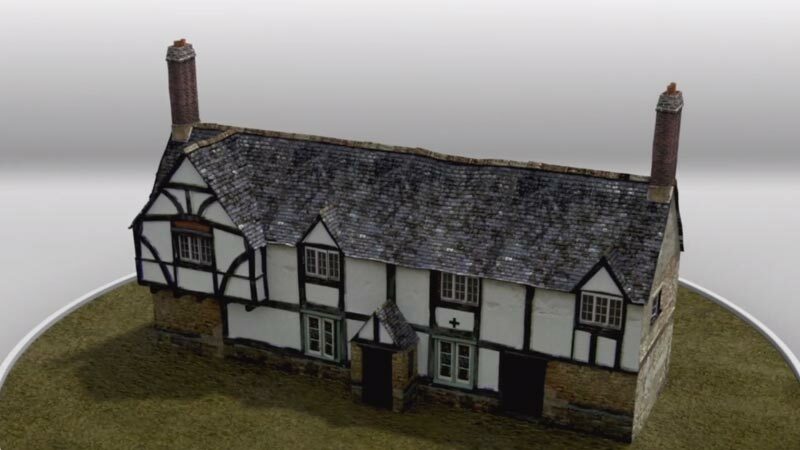 It was also vital to create detailed roofs, and for this we used Mudbox. This allowed me to sculpt in extra detail on the roof and also paint in a more detailed texture." With such a wide variety of unique houses, shops and outbuildings, "there wasn't too much we could do in terms of optimisation of the scene," adds Alex Dubus. "The only thing we ended up proxying was the vegetation!" With regards to the lighting, it was a fairly straightforward set up. "We just had an HDRI and a sun," says Alex, "the tricky bit was getting the right balance between the shadows from the CG that were projected onto the plates, and the baked in ones from the shot itself." The composting was supervised by Andy Hunwick, Lead Compositor at dock10, who describes the process: "The comp was composed of both of both CG elements and a few natural elements as well, such as smoke, and these were able to be positioned correctly in space because we also had the 3D camera." When it came to the background, Andy felt that less would be more. "In many ways, matte painting can be more of an inexact science," he says. "There can be quite a danger of overworking a matte paint, so it's really important to leave a random, almost unplanned element in there otherwise the viewer can feel that too much work has been done on a shot and that detracts from its believability." The result was brilliantly understated. With each unique asset painstakingly researched, recreated and embedded into the landscape, the village looks like it truly belongs in the shot and has been part of the scenery for centuries-exactly what the client wanted.